We dedicate this page for the people who we believe are our angels, accompanying us along this journey, supporting us and helping us in many different ways. Firstly we would like to thank Mr. Michael Doyle, a partner at Seri, Manop and Doyle Ltd. and an ex-president of the Rotary Club of Bangkok South for helping to connect us with the club and it led to the club donating a sum of money to help Peace And Happiness Foundation buy VDO production equipment. 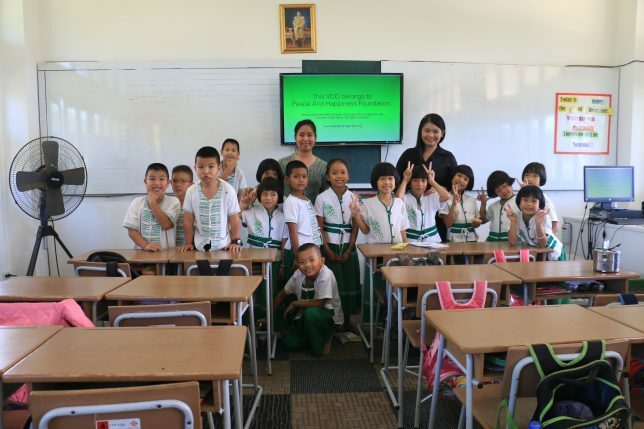 The club which has very strict rules and procedures to select which charity project they will support, decided to help us because they see that our program has a strong potential to make a huge impact on Thailand. Thank you very much Rotarians! Move Ahead Media Co., Ltd.
” My internship with Peace and Happiness was both the best experience and most challenging experience I have faced. 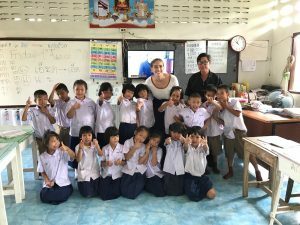 I was based in Thailand for a total of two months and was fortunate enough to spend half of my time working in the Peace and Happiness offices (in Bangkok) and half of my time at a school teaching children in Chiang Rai. 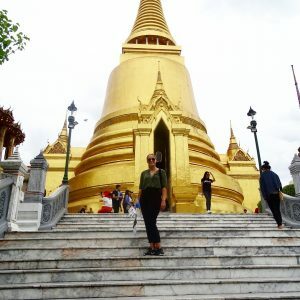 My first month in Bangkok taught me a lot about how a new NPO (non-profit organization) runs and the day to day challenges and tasks it faces. This includes recruitment, social media presence, visas etc. Working with Katrina, the one who makes Peace and Happiness run, I learned the goal for Peace and Happiness – to extend analytical thinking to the schools of Thailand by doing this through videos and comic books; I also learned how to get around Bangkok as she took me around the city, showing me the prettiest rooftop bars, to telling me about the ancient capital of Ayutthaya, and even taking me to the island of Koh Samet. My second month in Thailand was in the northern most region called Chiang Rai. There I was placed at a school, and lived with a host family. My experience here was challenging but so rewarding. From getting the young students to remember your name, to teaching them math, the progression I saw was the most amazing aspect of the entire experience. When it comes down to it when you apply for a volunteering job in a developing country you know that sometimes the food might be a bit wacky, there might be a few bugs, and it might be tough, but at the end of the day the experience overrides all the small discomforts; and ultimately might change your view and you as a person – for the better. Another aspect that I loved from this experience was the opportunity to go and explore on weekends. 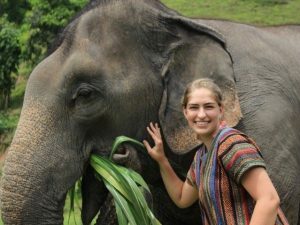 I went from learning the streets of Bangkok, to going to islands, to going to an Elephant Sanctuary in Chiang Mai. Peace and Happiness encourages you to take trips like these to further expand your travel in Thailand, and so that you are optimally happy, and don’t feel cooped up in one place. “My name is Aigerim and I’m from Kazakhstan. For two (2) months, I volunteered as assitant teacher in Huaihangpasa School at Chiang Rai province. My students were very kind, energetic and full of dreams! Every day they surprised and inspired me with new ideas about our lessons. We get to know each a little bit of each other as the day passes by and our class had more lovely and friendship atmosphere. It was a new life experience for me. When you spend lots of time with kids and you really become like them. You’ll start to laugh a lot and be amaze to simple things. I love to play different games with them, draw and have fun together. “Hi! My name is Jule, I´m from Germany and I´m 20 years old. I volunteered with the Peace and Happiness Foundation for 3 months. I worked near Chiang Saen at the Patungpittiyanukun school. 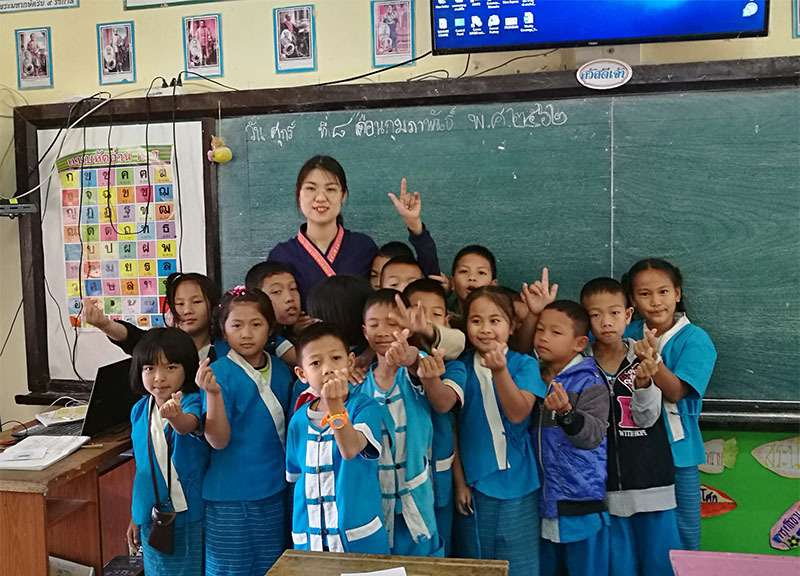 If you want to experience how it is to work as a teacher, meet Thai people and experience the real Thai life: This is the right address. 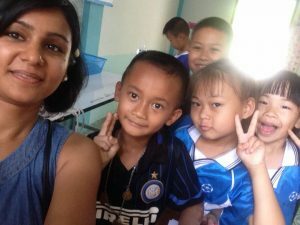 At first it was really challenging for me to get the kids to listen to me and pay attention (since I never taught before) but the Thai teacher and the people at the organisation were really helpful so that I was able to manage them pretty soon. Hi everyone, my name is Thoa. I am from Vietnam. I was a volunteer at Peace and Happiness foundation for one year. It was a beautiful time that I will never forget. 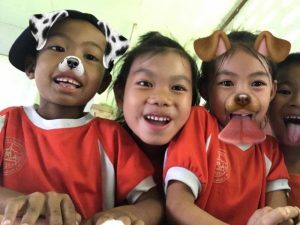 I had a great opportunity to help first-grade students learn English through media and doing class activities at Ban Na school, Nan, Thailand. I have gained many experiences in both supervising a classroom and encouraging little kids to speak English as well as to think critically. Ban Na school is my second home. It is not only a nice place.. but everyone is also very kind and friendly. I am thankful for all the teachers for always supporting me during my stay. Lastly I am extremely thankful to the president of Peace and Happiness foundation, Natasha Stewart. She has given me a lot of great advice to stimulate my personal growth. She always tries her best to help improve others’ lives, especially the unprivileged children with her beautiful heart. She is a role model who I look up to and I wish someday, I can follow her footsteps to make a positive impact on this world. I am L.A. Malaga – volunteer from Philippines. 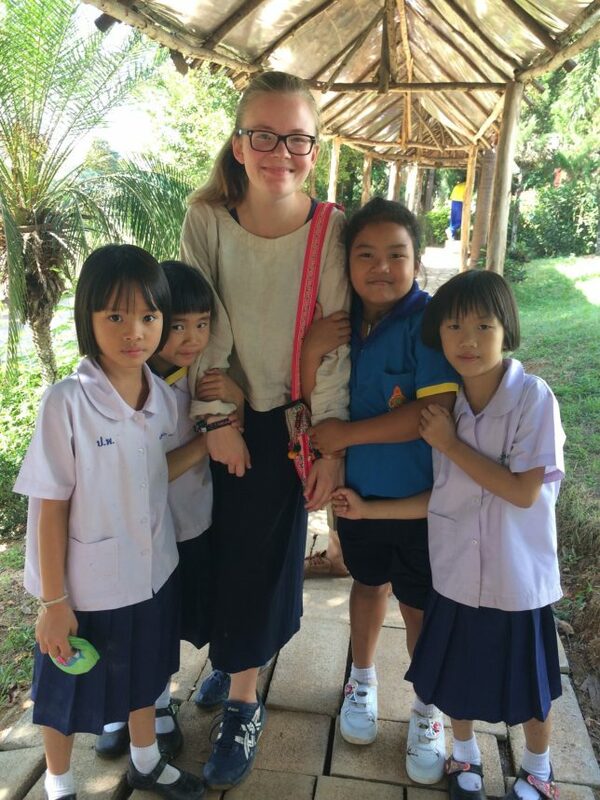 I became a volunteer teacher at Ban Pasang School in Chiang Rai Thailand for one (1) year. At first I was very nervous and I didn’t know what to do because of the new role I’ll be doing, which is to be a grade 1 teacher that far from being a law student way back home. But it changed when I got to know them better. The kids and the teachers who are total strangers became my family. They take care of me as if I’m their own daughter. I will be forever grateful for the opportunity that Peace and Happiness Foundation gave me. 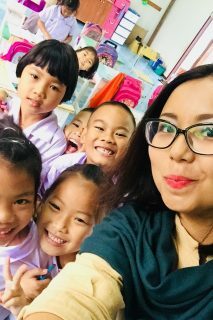 “Never say goodbye because goodbye means going away and going away means forgetting.” This quote fits my life as a Volunteer Teacher in Thailand. What I really like about Volunteering is that, I always socialize with my students. Kidding aside, “it’s always funny being a Teacher because it makes you feel like an actress or a superstar. Wherever I go, everyone is calling me, Teacher Melissa.” (hahaha) Sometimes, there are things that we regret when we get older. I had the chance to travel abroad when I was still working in the Philippines but it’s not enough compared to volunteering works. 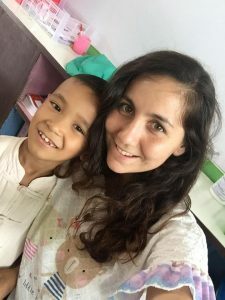 My volunteering abroad wasn’t a plan. It just came naturally and maybe a destiny to meet you. Volunteering is just a business course that I studied, be a risk taker if you want to succeed. 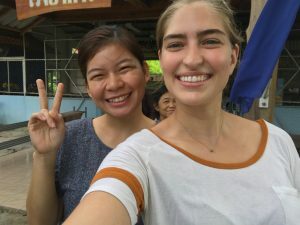 I am a little bit scared to do volunteering abroad but I had to take the risk because in reality, I support other peoples’ dreams rather than my own. My deepest gratitude to this organization, the Peace and Happiness Foundation and to its Founder and President, Natasha Stewart. This has helped me so much to become a better person and with this, my years of stay here in Thailand were full of hearts or love as they say. I would like to express my gratitude to our Director, Mr. Krittapas Nathungdech, for being a firm leader of the school. Likewise Teacher Sunan, and all the Teachers of CBBS for helping and guiding me at all times with my students. To the parents of my students. No matter how hard our life is, thank you for sending your child to school. I know, I will not be able to see them for years and I hope that I have inspired you and your child to reach their goals someday. Thank you for trusting me. Indeed, it was a great pleasure for me to join the academic journey of these little angels. To my students. You are all special to me. Each and every one of you has its individual talents and I’m very proud of that. This may be our last day of meeting and the last time that I will see your heavenly smiles, hear your heart warming laughs and deafening shouts. I am so happy that we are all here. Please forgive me, if sometimes I am strict because I want everybody to learn. I was even surprised and amazed that as my volunteering days nears to end, you never miss to embrace me before going home. Love your new teacher the same way as mine. Good luck to your future endeavors. To my best friend and mom in Thailand, Pa or Meh Muey, you’ve been so nice and thoughtful to me since I came here. Honestly, you’re more than a parent to me. You’ve made me find the happiness that most people can’t find. Words are not enough to describe you but you are so amazing. So why am I here in Thailand? Because Thailand is my second home. My students are my children. Thai people didn’t let me feel that I was alone as a Filipino but considered me as part of the family. 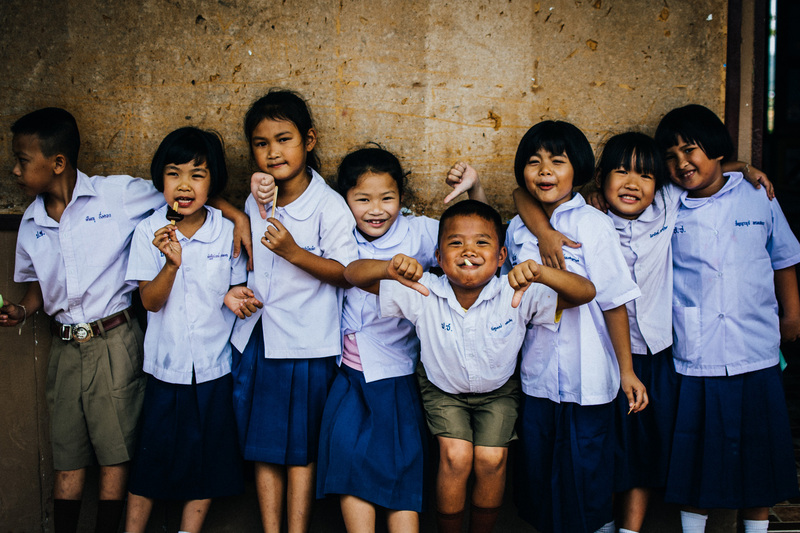 Truly that Thailand is known as the “Land of Smiles,” not only because of their beautiful scenic spots but because of the people. Their hospitality and generosity made me feel at home. Volunteering on Peace and Happiness Foundation, without any doubt, had been a pretty rewarding experience. 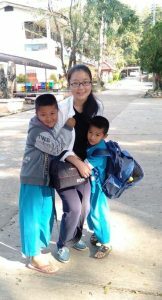 I was a volunteer at Ban Na School, Nan, Thailand. Even though I was a teacher before, I was afraid of teaching kids that did not speak the same language as me. Not only that, but I was very scared of living in a country that was very far from mine, with a completely different culture. But at the same time, I craved the same things I was scared of. I really wanted to get out of my comfort zone and use my time on something I was sure it was worth it. So, I did it and I don’t regret it at all. There were many changes and sometimes it was hard to get used to a completely different environment and life style, but I knew that greatest things in life doesn’t come easily. Also, the teachers and everybody at school were very supportive and did their best to make me feel at home and I am really thankful for that. My students started to learn many new things pretty quickly and the best part is that they were not just learning English and subjects like Math or Science, but they were learning many new skills and they were developing their analytical thinking: something I really think is key in Education, and in which I truly agree with Peace and Happiness Foundation. While they were learning, I was learning too. I was learning to live by my own, to appreciate the little things in life, what truly matters at the end, and to live according to my values. I love my students because even though we don’t speak the same language, they taught that language is not a requirement to connect with other human beings. I feel very happy that I got the chance to live out of my mother country, meet people from different cultures, and contribute on a program which is trying to improve the education in rural communities. This experience has certainly openned up my perspective and made me grow as a person. For me, it was also a time in which I realized the wonderful things I was capable of doing, the potential that all human beings have to impact other people’s lives. I also found myself feeling very proud for doing things by my own that I have never done before like traveling alone, being able to communicate without knowing the local language, and trying tons of new things. 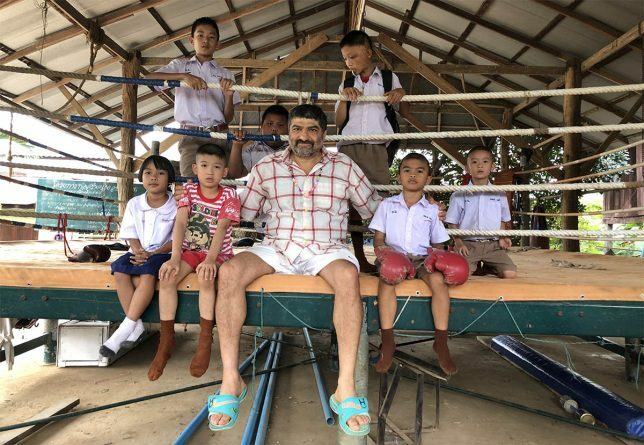 I am and will be very grateful to Peace and Happiness Foundation and Ban Na School for giving me the opportunity to live this life-changing experience. Everything is wonderful and everyone is very nice , I am very happy to be here. Students and staff are very nice and respectful. I am very happy that I have Wi-Fi in my room, I really appreciate that. The food is great and delicious, ️the children of Thailand are very nice, loving, respectful and smart. It is my pleasure to serve them and I love ️ all of them. It is my first time going aboard! However, it’s really good to be able to meet so many cute kids and kind people. Peace And Happiness Foundation gave me a chance to see the world from different perspectives and enriched my insights into life! If you don’t try, you will never know that there are such cultures and people in the world. In Pasang Nua school, people are very kind and polite. They care about each other’s feelings. Children like to ask you: “Give me five!” and hug you. They love drawing, dancing and jumping, maybe they love your company most! They always bring happiness! Sometimes they are very noisy, please be patient and accept it, clap hands for several times and play games help to make kids concentrated. They love to pass a paper ball to decide who to answer the questions! At last, their smile are so sweet! Once you see it, it’s hard to forget that happy smile! Volunteering with Peace and Happiness Foundation was awesome and rewarding experience. It was a great opportunity to discover new country and learn about diverse Thai northern culture. Huai Mak Iak School became my second home. Thai teachers are really helpful and friendly, they made me feel like part of the family. During my stay I managed to visit several northern regions: Chiang Rai, Chiang Mai, Nan, Lampang, Phayao. I’m very grateful to school for warm welcome and hospitality. It was amazing time and I’ll keep these precious memories forever. More patience. The students are too young to learn new knowledge quickly, so I teach them many times. To start with, this circumstance makes me a little annoyed and depressed, but after I try to put myself in the students’ shoes, I can know them a little. So I overcome my hurry and become more patient. Responsibility. 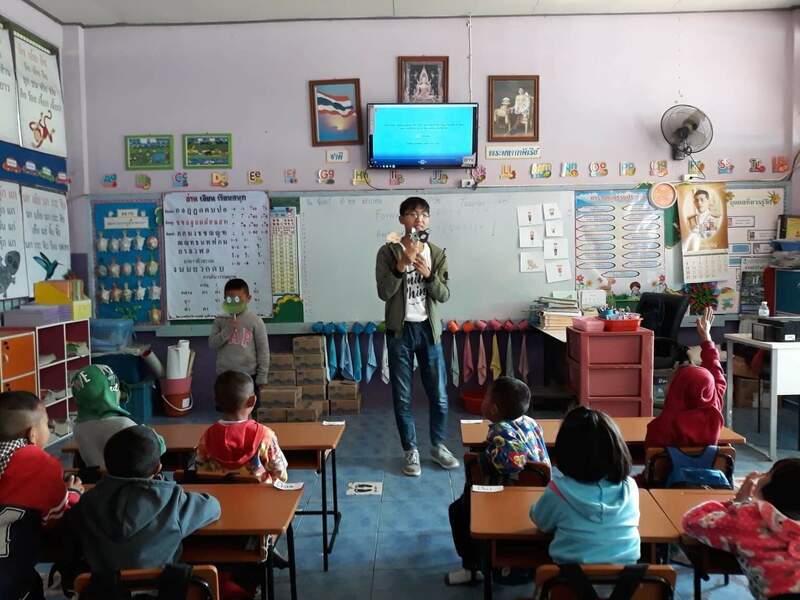 To be a volunteer, I taught Kindergarten 3 students , so I take responsibility for the classes, I get the nature of responsibility during preparing for lessons and give classes. Help. 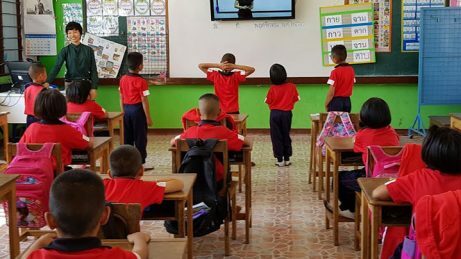 When you stay at a house with an A/C; when you enjoy a high-class education; when you can speak English in Grade 1, there exists some students have few classes every day which leads to cannot speak English. In this school, there are too many students in this circumstance. So in this world some people really need your help. In addition to above, I have too much experience, for instance, acquaint with many new friends , visit many cities and so on. Although it was only 1 month, this experience and precious memories would be kept whole my life. Maybe one day when I feel bad, the kind teachers and pure children will remind me of peace and happiness. After one month I have realized that life is not a race, it’s a dance that has to be danced. In the past I always thought that happiness is a future thing you get after becoming famous or something, but look at these cute faces, happiness is around us. I should cherish and enjoy every moment in my life. I taught 4 hours a day, after that I prepared to new lessons for tomorrow. Because some students really love studying, please teach them according to lesson plans and videos, we should be responsible for that. Please don’t worry about food and condition of residence, teachers are kind and generous, every week they took me and another Canadian volunteer to almost every famous places we could visit. We also went to teacher’s house and learnt many things about Thai culture. Thank you, my Canadian friend. 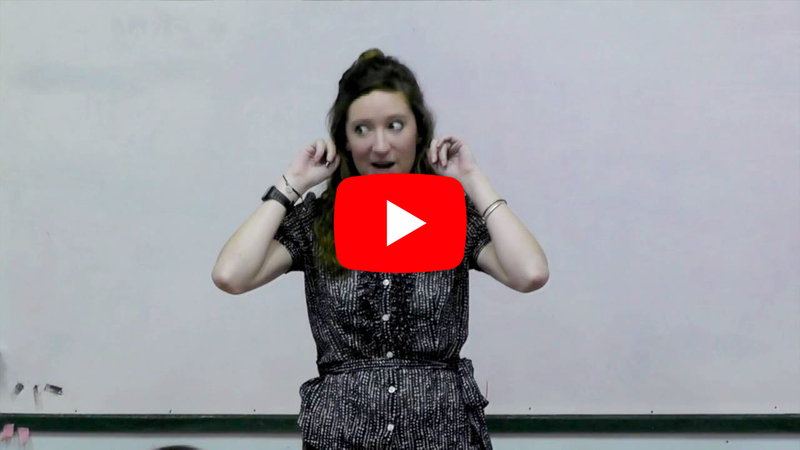 I was very lucky to talk to you about the differences between Eastern and Western cultures. Before dinner we walked around the peaceful village and enjoyed beautiful landscapes together. This is such a good memory for me. Thank you, Peace And Happiness Foundation, my life has become more meaningful. I will continue to be a volunteer and someday come back to see all my teachers and students. I miss you very much.